I'm sure we are all sat at home planning future trips at the moment. I certainly am - I'll be visiting my friend in India in October and I'm really excited...but also a bit nervous, as I got a bit enthusiastic and booked flights without even remembering that I'll have to apply for a visa. Let's hope that one comes through soon. What I was wondering though is whether anyone would like to share where they are thinking of going in the future? Then we have a good chance of perhaps getting advice from someone who's been before, and who knows, perhaps there will even be good story material in there? I think we could use this blog, you could simply comment if you are interested in sharing or e-mail me. My e-mail address is kerstin(dot)hammes(at)gmail(dot)com. 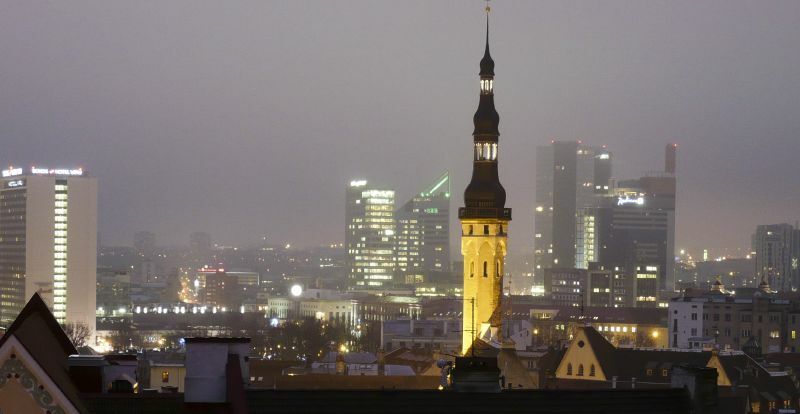 If Tallinn was a person, she would be Estonia’s wisest lady. She has been around for a thousand years. She kept her medieval beauty throughout, witnessing the power of Hanseatic trade, the struts and shouts of military dictatorships, and who knows how many Baltic storms. In the new millennium, this city is seeing a new generation of visitors –hordes of stags from other countries, seduced by legends of strong drink and beautiful women. Who knows how many of them open their eyes during this brief fling and find themselves falling in love with Tallinn? Estonia’s diminutive capital has many gems to show and stories to tell, and her cafés and bars are too inviting for just a brief stay. Tallinn’s heart is in the Old Town. A long stretch of the 13th century city wall still stands, with the tall Nunna, Sauna and Kuldjala Towers lining up like stone soldiers. 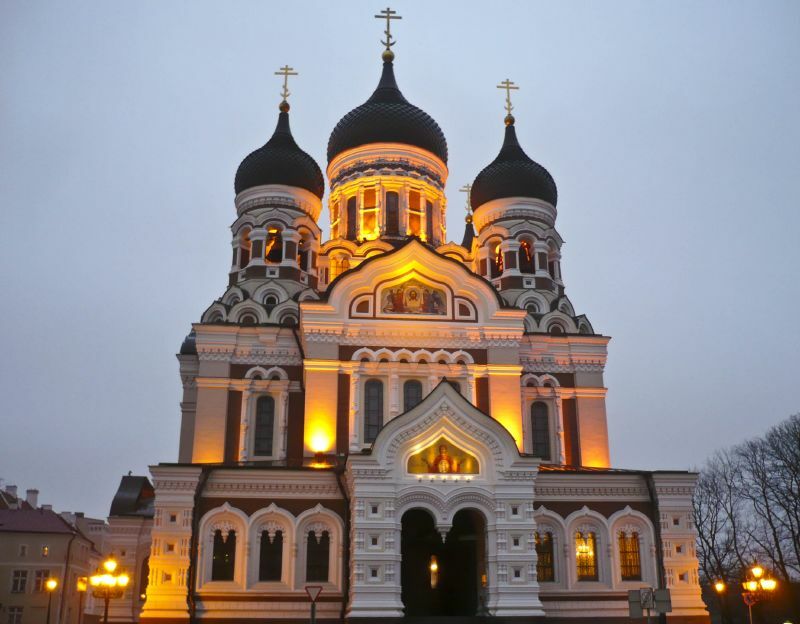 Visitors can admire the church of St. Olav, whose 124 metre spire is an essential part of the Tallinn panorama. From this northern point of the Old Town, the most important corner is only a short walk away: Town Square (Raekoja plats) is where the city celebrates in the summer and holds its Christmas Market in the winter. On one side you can spot Reapteek, Europe’s longest-serving pharmacy. On the Southern side of the square, Tallinn’s town hall is just another witness of the city’s age and history. The atmosphere is relaxed throughout the year. In the summer, street cafés invite visitors to take some time out over a hot tea, and in the winter Tallinn’s city centre ice rink is the place to be for tourists and teenagers. In the small Castle District of Toompea, the lady Tallinn reveals her colourful side. Stand in between Estonia’s pink government building, Toompea Castle, and the impressive Russian Alexander Nevsky cathedral, framed by yellow lights in blue dusk, and you’d be forgiven for thinking that you’ve been led into a charming bakery full of fairy cakes. The pink government building isn’t the only touch of sweetness that Tallinn has thought up. Find out that the reserved Estonians know how to spoil a visitor in Chocolats de Pierre. This café (hidden in “Masters Courtyard” in the old town) is a chocolate fan’s delight, an ancient-looking den where you can hide yourself away from the world and enjoy chocolates and cakes from Master Pierre. If you feel like a big softie after this romantic corner, seek out the DM Baar for a drink. It is a unique bar, totally devoted to Depeche Mode. Between bewildered tourists and die-hard fans there is always one more chorus to sing. Wherever you go in Tallinn, there is a whisper in the air that tells stories about Estonia’s history. The Museum of Occupation and Fight for Freedom delivers interesting stories of the 20th century and how people in this country lived under several occupations. It shows the pride Estonia feels to be an independent state, and this is something you can feel whenever you speak to people here. The country has developed quickly since its independence in 1991. Estonians speak fluent English, love the internet and will tell anyone that listens about Tallinn’s revolutionary mobile phone parking system, where users pay for their space by text message. I stopped at a school in the middle of an old and dreary Soviet estate and was greeted by their headmaster in a convincing Texan accent. She had just returned from a US trip and met George W. Bush, and no doubt conversed with him with the confidence of a stateswoman. Estonia and Tallinn might be small, but wherever you go the feeling seems to be that they are getting better than ever. Sacred cows sitting nonchalantly in the middle of the road watching the traffic pass by with inches to spare; no one takes any notice of them indicating it’s an every day occurrence for Nepalis. Less frequent were the sightings of the monkeys who seemingly appeared from nowhere taking me by surprise and giving me no time to press the button on my camera, a hoary grey boar trotting down the pavement among the people and a huge elephant out for a walk in the street with its mahout sitting on its back. The traffic in Kathmandu is a labyrinth of interweaving vehicles including animals and people, which is virtually, but never quite gridlocked. The fumes from the buses, cars, taxis, motorbikes, cycles, and tuk tuks adds to the smells and pollution and somehow all manage to keep moving around each other to arrive safely at their destination. Crossing the road however can be rather alarming although there is an organised chaos about it. I found that on the whole walking steadily with no quick movement is the best idea. Watching 2 wheeled vehicles can be even more heart-stopping when whole families travel on a motorbike. It’s incredible. A husband, 3 children, and wife (riding side-saddle) all sharing a seat on a 2 wheeled vehicle and only the husband wearing a crash helmet. Any one of the public modes of transport can be a challenge or an adventure in itself. The cheapest of these is the 3-wheeler electric tuk tuk which is designed to carry about 6 passengers. The usual number appears to be 12 or so and at every stop more people get on than get off. It is truly amazing to see men, women and children crammed like sardines into the smallest of places and even more amazing to be one of those people. On a larger scale there are the buses which travel to every corner of the city and like the good old British bus, 2 or 3 come together and then there is a lengthy gap before the next one arrives. Buses in Nepal never leave for their journey until they are full – so I was travelling on a bus for a 30 minute journey which was packed to capacity, all seats were occupied and there were 2 rows of people strap-hanging in the aisle. After 10 minutes we made our first stop and it was a great relief to see one man get off which would allow fellow travellers some breathing space. Or so I thought! The man alighted, and in his place 13 others got on, including a farmer who brought with him 4 sacks of millet and 2 sacks of rice. At the next stop 2 more passengers got on carrying 2 bottles of water, each bottle containing 20 litres. It was a joy to arrive at my destination 1 hour later, still being able to breathe and without suffocating. The moral of this story is that in Nepal - ’there is always room for one more’! I’d made the mistake of not booking accommodation ahead of time. It was 9pm and the Everglades were getting dark fast. Motel after motel had turned me away and the prospect of spending the night in my car was becoming increasingly likely. Finally, in the middle of Everglades City, I stumbled across the Captain’s Table, which miraculously had a room. Shortly thereafter, I was swimming in the motel pool beneath a sky crowded with stars, with only a wooden boardwalk separating me from the nocturnal noises of the sweaty glades. I knew I’d found someplace special. This was my introduction to the enigma of the Everglades: human habitation precariously balanced on the edge of nature. Occasionally the later takes charge, such as the direct hit taken by Everglades City from Hurricane Donna in 1960, which wiped out many of the town’s buildings and its entire infrastructure. As I discovered during my stay, however, when it comes to long term destruction, human hands are causing far more damage. Barely twelve hours after my night swim, I was pulling on water shoes and preparing to start one of Dragonfly Expedition’s eco-walks through Big Cypress National Preserve. The preserve is one of the large parks at the southern end of Florida, which links into the area known generically as the “Everglades”. Located between Miami and Naples north of Hwy-41, the preserve’s 729,000 acres act as a watershed to protect southern Florida’s other large conservation area – Everglades National Park. Hugging the tip of the state, Everglades National Park contains more than 1.5 million acres of complex natural habitats, half of which is water. By far the best way to discover the ‘Glades’ is by taking an eco-walk. And, as my guide Michael Cushing explained, this area is as vulnerable as it is beautiful. As we stepped from the edge of Hwy-41 near Big Cypress Gallery, I was surprised by the speed at which nature closed in. In the space of a few feet, the natural world engulfed my senses. Small cypress trees draped with Spanish moss crowded round and short stubby roots called ‘elbows’, cluttered the ground. Native orchids and bromeliads hung from the trees whose leafy branches joined together to form a canopy of green, fragmenting the sunlight that streamed through. Far from silent, the air was filled with the sounds of hammering woodpeckers and the cries of short-tailed hawks. As I walked on spongy ground that months before was waist deep in water, Cushing explained that the Everglades is North America’s largest remaining subtropical wilderness, and as such is often misleadingly referred to as a swamp. In fact, at the heart of the Everglades is a fifty-mile wide, freshwater river fed by Lake Okeechobee, fifty miles to the north. The term ‘Everglades’ refers to the miles of partially submerged sawgrass – the most visible feature of the habit. Before human intervention this whole area, lake to sea, was one unified environment, its vitality controlled by the ebbs and flows of the waters that feed it. Although vastly reduced, a large expanse of surrounding land is still soaked by this river’s overflow and forms a landscape of mangrove waterways, sawgrass marshland and tree islands, all of which lean, very gently, towards the sea. Step back for a minute and look around, and you will discover that the Everglades is made up of two very different landscapes. The first – characterised by boundless horizons, limitless sky and unrelenting flatness – makes an immediate impression. The second landscape, however, only reveals itself upon closer inspection. Teeming with life, from giant alligators to the tiniest of insects and the most delicate of flora, this close-up view is as exquisite as the sweeping panorama is vast. Human invasion of this intricate environment followed the completion of Hwy-41 in 1928, as loggers, oil riggers and land speculators all descended onto the Everglades with their own individual brands of economic exploitation. Wildlife has suffered ever since. Although I’d passed many road signs asking motorists to watch out for panthers, the truth is I would have been extremely lucky to see one. In the late 1800s, as Miami was developing, Florida panthers were considered a threat and hunted to near extinction. Cushing estimates that ten remain alive in the park, inbred and dying of chemical poisoning. Another species bearing the brunt of human expansion is the West Indian manatee. Although not hunted, the manatee is as endangered as the panther – a third of their deaths are related to human causes such as pollution and collisions with boats. Like most tourists I had planned to take an airboat ride into the aptly named ‘river of grass’. It hadn’t occurred to me that these trips were also part of the environmental problem, as many boat operators are more concerned with profit than preservation. Although most pollution in the Everglades is a result of agricultural and industrial waste, airboats also leak oil and gas into the river. Their constant use of the same routes leaves scars in the environment, and their attempts to ensure wildlife sightings can be downright alarming – some operators even provide passengers with marshmallows to feed alligators, an illegal strategy in the park since it causes the animals to lose their natural fear of humans and become aggressive. In the hands of responsible operators, such as the National Park rangers, airboats are not a problem, but more environmentally friendly options, such as kayak or canoe tours are readily available. After leaving Big Cypress National Preserve, I travelled east to Florida City on the southern outskirts of Miami. Here the landscape changed from green glades to parched farmland and I began to realise that water, or rather the surprising lack of it, is a problem in the region. The proprietors of the Everglades International Hostel at Florida City had put notices above their showers requesting that guests only use them if absolutely necessary. For years water has been systematically siphoned away from the Everglades, through an elaborate system of canals, to urban areas. The sobering truth is that if the Everglades continue losing freshwater, and the sea invades, the small aquatic organisms that anchor the food chain will not be able to survive and the whole complex habitat will die. Packing up my bags to leave the hostel and the most threatened of North America’s National Parks, I mulled over one of the great conundrums of travel writing. In this fragile environment, it is clear that tourism can play a direct role in ecological destruction. But, it can also play an important part in the preservation of the area. By exposing visitors to the beauty and mystery of the Everglades, a larger coalition can be built to save it. It’s a difficult balance to strike, but every year an increasing number of tourists leave inspired by the area and more sympathetic towards environmental campaigns and government initiatives to save this and other endangered habitats. A naïve dream perhaps, but one thing is clear, unless visitors tread lightly on the Everglades, they won’t remain glades forever. © Lesley Anne Rose 2002. Previously published in Rough Guides’ Rough News. Driving across the Yakima Indian Reservation, hands still sticky from gorging ourselves on the biggest peaches we had ever seen, and with the sun burning our necks through the open sun roof we breathed in deeply the heady scents of fruits and berries, ripe vines and recently cut corn fields. The car temperature gauge showed 93 degrees but it felt hotter. Switching from the hell-fire preachers on the car radio to 97.7 KCFM “Live from Dave’s Diner”, Louie Louie played us into Hood River on the Columbia River Gorge and we took the opportunity for a welcome beer and a steak at the only Mexican restaurant in town. Our September road trip through the Pacific North West was supposed to be a cooling, refreshing fortnight to appreciate the early fall colours in the dense forests of Washington State and hike up some of America’s highest peaks – the guide book didn’t mention that parts of the state out towards Idaho were semi-desert. This area is largely untroubled by international tourism, and visitors who fly in to Vancouver or Seattle are missing out on a varied and wondrous landscape of glacial peaks and parched lowlands, of alpine meadows, sparkling lakes and unique wildlife, all of which defines this part of North America. By the end of two weeks in small-town America we had breezed through life on the road with little traffic, climbed mountain tops which left us breathless, traversed semi-desert which found us squinting into the heat haze, and driven through canyons with only bald eagles and elk for company. Although Washington is trying to reinvent itself from the ‘hometown’ values of the Apple State (for it produces much of the country’s fruit) to chic wine country to attract more visitors, many places welcomed us as the first Brits of the season. We’d spent the whole day driving over the Lost Horse Plateau, a scene of shorn golden hills recently harvested of their cereal crops and occasional wine estates reclaimed from the dry mountain sides by ingenious irrigation and careful tending. Like a scene from Steven Spielberg’s Duel our only road companions were the fearsome Mack trucks, huge loggers forever threatening us in the rear view mirror; gathering speed from the steaming two-lane blacktop over miles of ruler-straight roads - the only thing to do was to pull over and wave them past because they weren’t braking for an Englishman in a rented Lincoln. Notwithstanding the inspiring landscape, the Yakima Reservation is a dreary collection of non-descript towns, malls and, incongruously, high-rolling casinos, which were built after special dispensation for legal gambling was given to tribal lands in the late 1970s. With more than their fair share of poverty, crime, alcohol abuse and poor educational facilities, casinos seem to be the last thing these areas need. We finally made it to the vast Columbia River thundering down from the melting glaciers higher up the valley – responsible for half the nation’s hydro-electric power - to follow the awesome construction that is the Columbia River Highway. The scenery is breathtaking from the vantage point of the river road; straddling the mile-wide river and egged on by countless waterfalls on both the Washington and Oregon sides, the two roads and two railway lines race each other down the river’s course all the way to the Pacific Ocean. The wind funnelling down between the two states over the water makes the resort town of Hood River a mecca for wind surfers, a sporting invention that saved the town from stasis in the 1980s. But the heat made us wish for the cooling breezes of the Cascades we had visited a week before, a range of mountains unfolding hundreds of miles down through Washington into Oregon and throwing up a string of volcanoes including Mount St Helens which blew her top in 1980 (losing 1300 feet from the peak) and devastated a vast forested area killing 57 people and millions of animals. But only America could turn a natural disaster into a compelling tourist destination. With explanations of the geological implications of the volcano and the process of regeneration the ‘Interpretive Center” was a fascinating glimpse into the destructive power of nature and what science has since learned. Other mountain tops boast names such as Damnation Peak, Mount Despair and Mount Fury and are every bit as untamed as they sound. This is the high country that Jack Kerouac wrote about in his books The Dharma Bums and Desolation Angels after spending two months holed up in a remote shack on Desolation Peak as a fire spotter. Although Kerouac is best known for his seminal trans-American odyssey On the Road, his time spent on the mountain was a God-send for the environmental movement as it introduced many people to the wonders of the unspoilt American countryside and the need to protect a great natural resource. The one-room shack is still a site of literary pilgrimage. “I went out in my alpine yard and there it was … hundreds of miles of pure snow-covered rocks and virgin lakes and high timber,” he wrote in The Dharma Bums. “Below, instead of the world, I saw a sea of marshmallow clouds …” Thanks to environmentalists who followed him, the view hasn’t changed since. Next stop was the Mount Rainier National Park for three days of hiking on Washington’s highest peak. At 14,411 feet (4392 metres) the mountain stands as a snow-capped beacon for the state, although approached more closely, it hides behind a frustrating curtain of cloud. We braved fierce rain at 4500 feet and freezing snow at 5400 feet but were never rewarded with a sight of the icy peak close up. In fact I was more anxious to remember the park warden’s advice on what my response should be if I encountered a bear: “Black bears - fight back, grizzly bears - play dead”. Or was it the other way around? After all that activity our bodies deserved some pampering but hotels can be an impersonal way to meet people while travelling so, for the most part, we sought out bed and breakfasts. Meeting the innkeepers in their own homes proved to be an entertaining highlight of the trip. We stayed at B&Bs that left us alone with stunning views, and others that seemed loathe to let us leave in the morning. One wouldn’t leave out any food for an early start, while another served a seven course breakfast of fresh fruit, baked apple, apple fritters, oatmeal with brown sugar and cream, eggs and pork chop or grilled trout with hash brown potatoes, biscuits (a kind of heavy scone), rounded off by a stack of buttermilk pancakes covered in maple syrup. ‘Good morning’ cocktails and champagne was extra. Our favourite was a two-night stay at A Touch of Europe, set in the wine lands of the Yakima Valley, and which promised an evening meal – a welcome relief from cruising a strange town for sustenance. But the twee name of the house turned out to be no idle boast. Jim, of Italian descent, and Erica, who had not yet shaken off her East German accent, have transformed a unique Victorian mansion (now on the National Register of Historic Places) into the B&B of our dreams. Unashamedly luxurious, the house was stuffed with period fittings and furnishings, authentic wall coverings and an ambient calm, the effect on the visitor was one of immediate serenity and separation from the outside world. This clearly wasn’t just another B&B. A swift visit to a local winery ensured a robust accompaniment to the main event - Erica’s sensational cooking. Jim – quiet, helpful, brimming with old-world charm – was the perfect foil for the ebullient Erica who exuded a love of life, and cooked that way. After eating some of the best food we have ever eaten in the US, Erica joined us and admitted that she is being feted by TV crews and food writers from around the world, although the house is still run exclusively by the couple who see it as their duty to provide an outpost of seriously good nosh among the ubiquitous fast food in this part of the world. Memorable too was Mountain Meadows Inn on Mount Rainier, a mixture of ultra-laid back service (the once-sophisticated owners had gone decidedly native) and an ecological shrine. The bed (a room filled with curios of Native American culture) and breakfast (vegetable soufflé and French toast with cream anyone?) was more enjoyable than most. Proprietors Harry and Michelle saw themselves as protectors of the ecological faith as told by the man who many think started the movement – John Muir. Muir, a Scot who moved to the US as a child in the 1840s, was the first person to call for action to protect the world’s wild places. He became a founding father of the conservation movement in his adopted homeland and devoted his life to safeguarding vulnerable landscapes for future generations. Harry and Michelle became inspired by the conservationist and gave up their careers to move to the remote outpost to be closer to untamed nature, filling their house (or more accurately, museum) with first editions, letters and mementoes of Muir’s life and a library reflecting their sensitive appreciation of the contribution of the Native American – latterly known as First Nation peoples. The stop was a fascinating insight into a little-known side of Americana. The final leg of the trip brought us over the border to Vancouver. There’s no denying the Pacific Rim city is a delight on the eye, but after the rugged country of the Cascades and the Columbia River Gorge the Canadian city seemed too tame by half. It is as if the city fathers read the text book on how to build a city – and they achieved it. How boring is that? The city had no edge and little excitement for us, unlike the best cities which seem to make it up as they go along. This is probably anathema to the many people who rate Vancouver the most beautiful city in the world. Doyenne of travel writers Jan Morris once said that Vancouver is ‘a city everyone would like to live in’ … but they don’t. She probably preferred the untamed Mount Fury and 97.7 live from Dave’s Diner, as I did. Three Fifteen for Tea is a collection of travel writing from a group of 11 writers based in Lancashire who used to meet at 3:15pm for tea.